This month’s Design Style Guide focuses on what is arguably the hardest style to pull off, yet it has the biggest impact when done right. Eclectic should only be tackled by the bravest of decorators – here’s my guide for those who are feeling adventurous! Definition Eclectic is the style that “breaks all the rules” and creates its own guidelines. It is also the hardest to pull off. 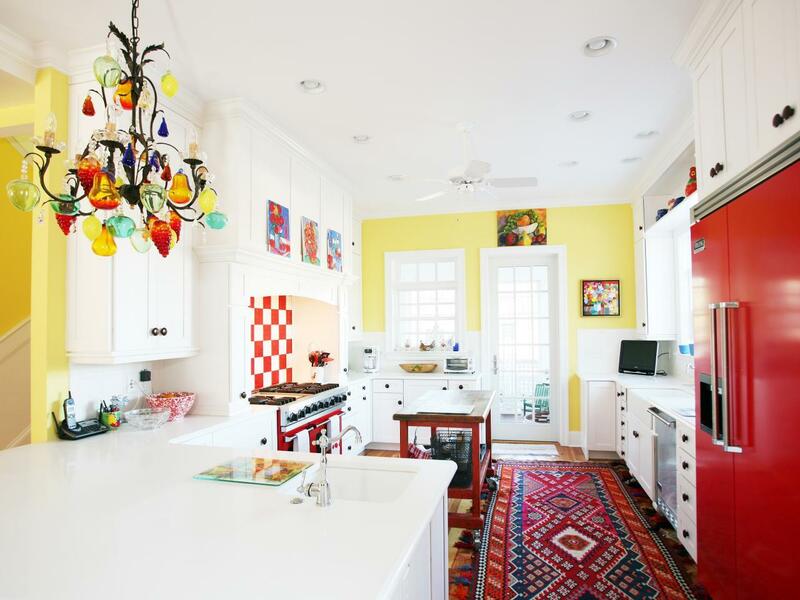 Eclectic design is a carefully put together, well-thought-out mishmash of several design styles. It may mean a living room with traditional floral wallpaper, a mid-century modern seating group, a southwestern area rug, and bright contemporary accent colors – that somehow all manage to work together beautifully. Done poorly, eclectic can feel like walking into a Picasso. Done well, it will feel like your favorite, worn-out pair of jeans – it just fits. History Eclecticism is a little known architectural style of the late 19th and early 20th centuries where classical Roman and Greek architecture was combined with (at the time) contemporary styles to create a completely new look. The Eclectic style of designing interiors got its name from this architectural style. Eclectic began to come into fashion for interiors in the 1970’s. Spot the Style Though it may seem like Eclectic is all about just throwing random items together, there actually is a distinct look to the style. There is typically one bright, bold color the ties the space together. Prints tend to be natural and organic such as southwestern patterns combined with vaguely animal print throws. Furniture may come from different styles but will mimic each other’s feminine curves. Glass is a common material for accent pieces and side tables. Gallery walls combine every type and time period of art, with the frames connecting all of it together. Eclectic is the easiest style to spot – it’s clear every element comes from a different style but they all work together to make a space that feels bright and inviting. Notables No one puts together an eclectic home like Rita Konig. Her 9th Street rental in New York takes the style to another level. She manages to blend bright purple velvet upholstery with black and white animal print throw pillows and a kilim rug in the living room, while decorating the bedroom with traditional Victorian wallpaper, and then throws in ultra modern, sleek white cabinets and countertops in the kitchen and it all just works. Her spaces feels welcoming, lived in, and yet sophisticated. It is not an easy style to tackle, and Rita does it naturally. Where to Shop Eclectic is a complicated style, so for this one I thought I would break down my design process. 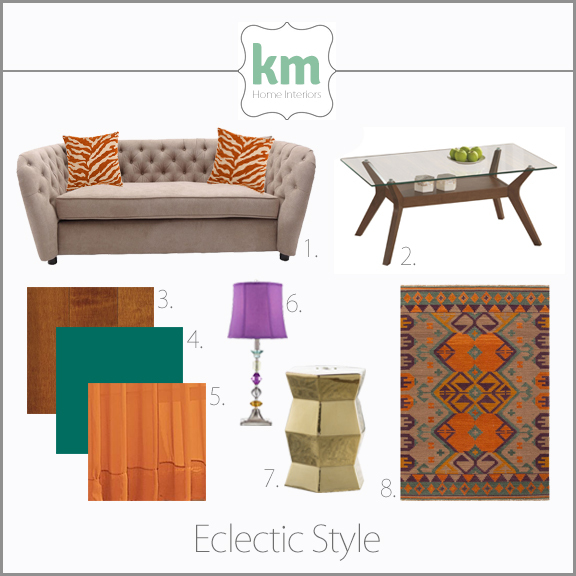 To create this concept board, I started with the kilim area rug, which is a common style used in eclectic spaces. I used the colors in the rug to guide my choices for the accent pieces (pillows, lamp and curtains). The loveseat is ornate to balance the simplicity of the coffee table, which was chosen because the legs mimic the pattern in the rug. The gold stool also mimics the pattern in the rug and adds a pop of metallic to the design. The wall color is a brighter, bolder version of the blue in the rug. The maple wood flooring contrasts well with the bold wall color. By connecting all of the elements of the design to each other in this way, I created a cohesive look while bringing in items from several different styles.